In Hong Kong, we have 2 training locations to answer differents wind direction. We are located September to March in the East to NorthEast Wind. The Bearch, SHUI HAU WAN, is like a huge pool to learn Kiteboarding with shallow and flat water. Kites can be set up on beach or on grass. 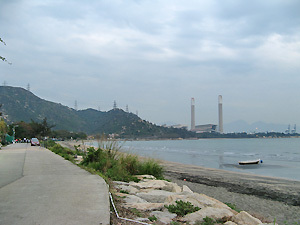 Side to Side/on wind.SHUI HAU WAN is 30min drive from Tung Chung MTR station, main tourist area. We are located for the period March to August in the South-West part at LUNG KWU TAN, closest beach from Tuen Mun: We're teaching there from different location depends on the wind direction. So we can teach in shallow and flat water or improving your wave style. Wind direction Side to Side/on. Picture of LUNG KWU TAN. From September to March we receive East or NorthEast wind, March to August wind is blowing from the South West. Wind range from 8 to 20 knots, perfect for the beginner and intermediate. Direction Side to Side/on on the spot. Please checkHong kong Predicted tides table. Booties are recommended for beginners. No nasty marine animals to watch out for here. At LUNG KWU TAN the water has surfable waves in the middle. Booties are recommended for beginners. No nasty marine animals to watch out for here too. At SHUI HAU WAN is like a huge pool to learn Kiteboarding with shallow and flat water. 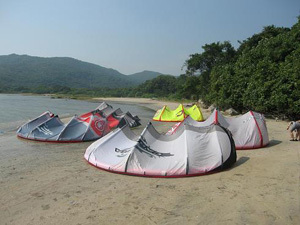 Kites can be set up on beach or on grass. stop at Shui Hau Football Field. Follow a path beside the football field in 1 minute. You arrive there!